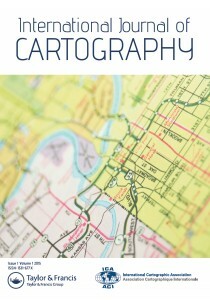 At the 27th International Cartography Conference in Rio de Janeiro, Brazil, the online tool “OV-Map” won the second jury prize in the category digital products. 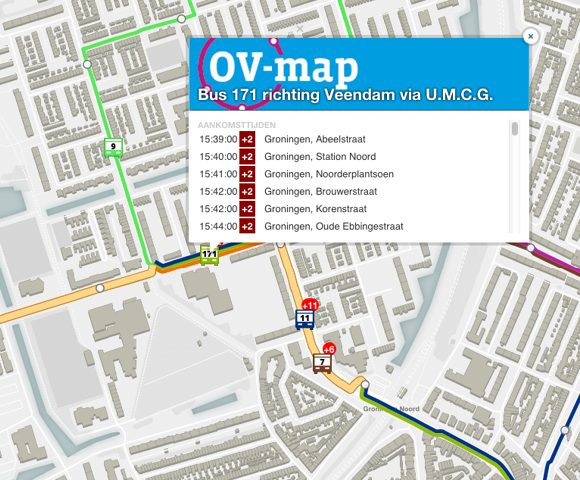 Publisher’s Description: OV-map is a web map that shows the public transport network in (for now) a part of the Netherlands based on the GTFS data that public transport companies provide. Even it’s still a prototype right now and we will add more functionalities and improvements, we proudly present our ICA map award winning web map. 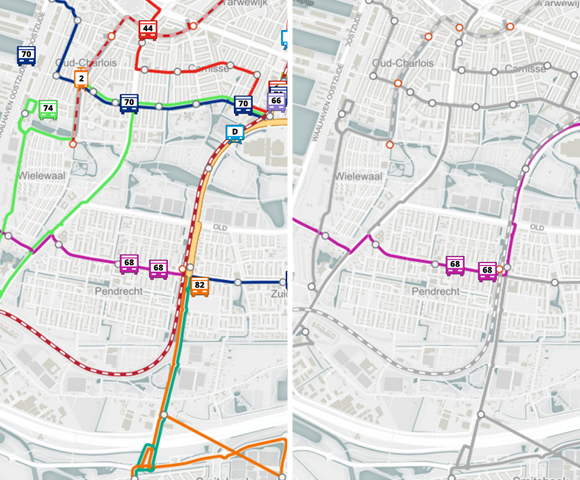 Above a well thought topographic basemap, the web map shows the routes, stops and vehicle positions of different public transport types. It’s possible to display delays of the vehicles. 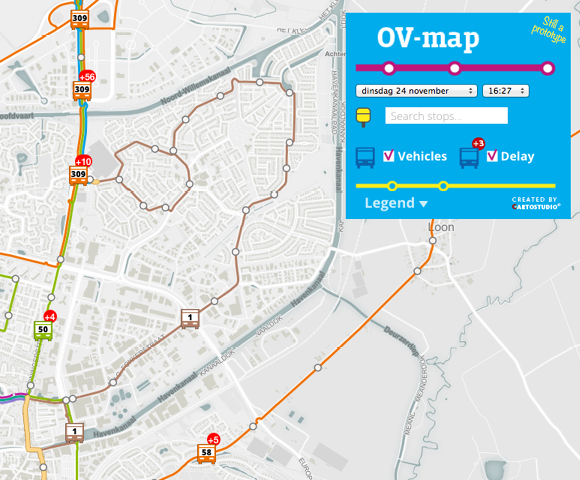 The routes and vehicle position on the map are based on the standard timetables and updated with real-time information. Therefore you can pick a date in the future and see the routes of the timetable at that moment while at the current time you can see the actual positions with possible delays. 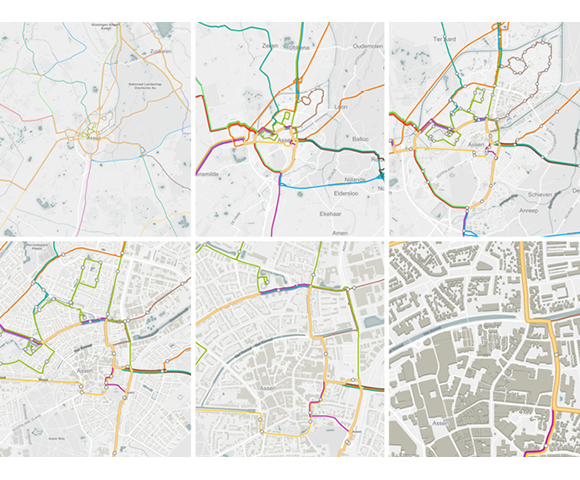 The challenge of this project was to reproduce a web map that follows the cartographic rules of current paper public transport maps combined with the real-time actuality derived from the GTFS data. 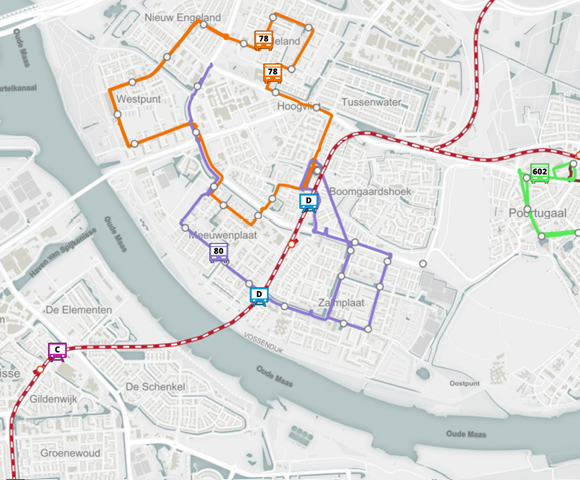 A common cartographic rule in the Dutch public transport maps is the display of the routes as a fat single line when four or more lines come together on the same route. Two or three lines on the same route are displayed parallel of each other with an offset and in their individual color. The total network with bundled lines and parallel lines with offset are automatically generated.